A wrapping front porch and round-top windows add to the appeal of this gabled and dormered charmer. Vaulted ceilings in the foyer and great room add volume, and space is further enhanced by the openness of the floor plan. Bordered by railing on two sides, the U-shaped stair contributes to the feeling of spaciousness. An efficient kitchen features a pass-thru to the dining room and access to the back porch. 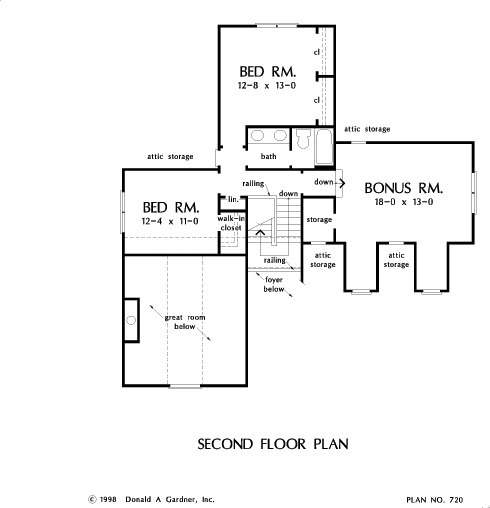 The first floor master suite also accesses the back porch and features a lovely bay window, his and her closets, and private bath. Upstairs, two bedrooms, each with liberal closet space, share a generous hall bath. Abundant attic storage is easily accessed from the hall and bonus room. 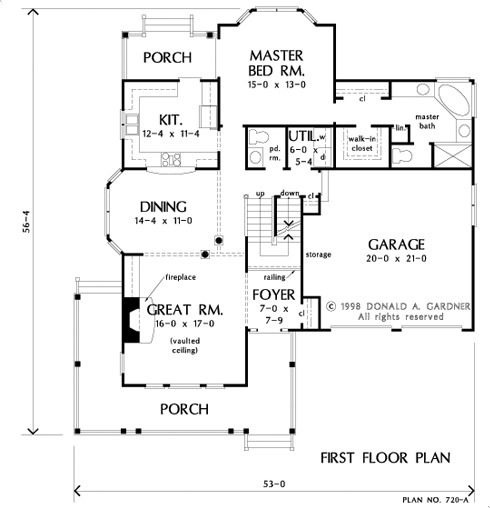 1st Floor: 1370 Sq. 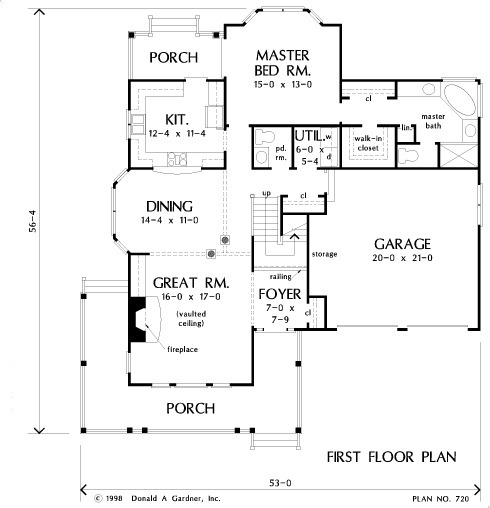 Ft.
House Dimensions: 53' 0" x 56' 4"
Garage Storage : 2' 4" x 10' 8" x 0' 0"
Porch - Front : 29' 4" x 6' 4" x 0' 0"
Porch - Rear : 12' 8" x 6' 4" x 0' 0"
Porch - Right : 6' 4" x 7' 4" x 0' 0"
Foyer : 7' 0" x 7' 9" x 9' 0"
Dining Room : 14' 4" x 11' 0" x 9' 0"
Great Room (Vaulted): 16' 0" x 17' 0" x 18' 0"
Kitchen : 12' 4" x 11' 4" x 9' 0"
Utility Room : 6' 0" x 5' 4" x 9' 0"
Bonus Room : 18' 0" x 13' 0" x 9' 0"
Storage (Bonus) : 4' 0" x 5' 10" x 0' 0"